Lick 3 - . :Shred Tricks - Shred Guitar Lessons by Eric Maldonado:. Hey guys, Welcome to this weeks lesson! 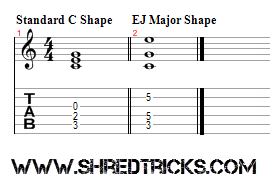 This week we are looking at a cool EJ chords/Triads concept. You hear a lot of this in Eric's playing and music. He uses it in almost every lead solo of he does. The concept is this: A regular chord is seen as Root, 3rd, and 5th. Those are the intervals found in the chord. To make it easier to understand, a C Major chord is 3rd fret A string, 2nd fret D string, and open third string G.
But an EJ major chord switches around those last to notes so we get something like Root, 5th, and 3rd. You get a really Eric Johnson, Neil Zaza, and Holdsworth-esque sound. Check out the difference below, play both chords and you will hear they have the exact same notes in them and sound. But the EJ chord can be used for crystal sounding triad chords as well as open voiced arpeggios as you hear in EJ's hit instrumental "Cliffs of Dover". Here are the triads going up the C Major scale. Like I mentioned above, you can use these as chords(in any key you like, just use the R, 5th, 3rd method)) as well as, open voiced arpeggio runs.